General Wladyslaw Anders led free Polish forces in their fight against the Nazis. “They had lost their country but kept their honor,” future British Prime Minister Harold Macmillan said of General Wladyslaw Anders and the Polish II Corps, men in the strange position of trying to win the liberation of their homeland by fighting in Italy. It is hard to imagine any other general of World War II having a more personally tragic odyssey than Anders: witnessing the devastation of his country, nightmarish captivity at the hands of the Soviet secret police, a trek to freedom across central Asia and the Middle East, and glory on the battlefield of Monte Cassino ending in a lifelong, bitter exile. Born in 1892 when Poland was still part of the Russian Empire, Anders deserted from the czarist cavalry during World War I to fight for independence in the Polish Legion of Jozef Pilsudski on the German side. Anders also fought under Pilsudski to defeat the Russian invasion of 1920, but then against Pilsidski when he overthrew the government in May 1926 and established a dictatorship. Pilsudski did not hold it against Anders, who was allowed to stay in the Army. When Pilsudski met him at a reception four years later and saw that Anders was still a colonel, he made a point of promoting him to brigadier general. Anders was in command of a cavalry brigade just 13 miles from the border with Germany on September 1, 1939. During the opening minutes of World War II, he watched helplessly as Luftwaffe squadrons passed overhead on their way south to destroy the Polish Air Force on the ground and bomb the Polish capital of Warsaw. In the chaos that followed, Anders had to waste precious days inching along roads jammed to a standstill with panicked refugees and disorganized soldiers under constant air attack while he was trying to reach a new command and then, almost immediately, another. He finally led a surprise counterattack near Warsaw, taking 1,000 German prisoners, before it fell apart because of communication failures. Compounding the nightmare, on the 17th day of the German invasion, the Soviet Union “flung herself like a hyena,” in Anders’s words, on Poland as part of Stalin’s pact with Hitler. Trying to evacuate his men to Hungary, Anders was wounded for the eighth time in his military career and was captured by the Soviets. A Lubyanka guard seized Anders’s religious medal of the Virgin Mary and crushed it underfoot, saying, “Let us see if this harlot can be of any help to you in a Soviet prison!” When Anders did receive miraculous intervention, the inspiration was more satanic than divine. Suddenly, on August 4, 1941, Anders was pulled from his cell and marched to the warden’s office. Squinting repeatedly in the unaccustomed light, he faced a bespectacled official who said simply, “Who am I addressing?” asked Anders. “I am Beria,” came the response. Instead of the customary bullet to the brain he often meted out, the feared NKVD chief Lavrenty Beria informed an astonished Anders that he was to be the commander of a new Polish army composed of Poles imprisoned in the Soviet Union. In prison uniform and barefoot, Anders was then driven out of the Lubyanka in Beria’s own limousine and installed in a four-room luxury apartment with cook, maid, and ample stocks of caviar and vodka. Hitler had attacked the Soviet Union, and Stalin was desperately seeking allies anywhere he could find them—even the London-based Polish government in exile headed by Prime Minister Wladyslaw Sikorski. Anders had to first determine just how many men he would have to fight with: “I tried to assess the real figure of Polish citizens deported in 1939-1941, but it was extremely difficult to do so. I questioned the Soviet authorities. Eventually I was directed to Fiedotov, an NKVD general who was in charge of this matter, and I had a few conversations with him. He told me in a most confidential manner that the number of Poles deported to Russia amounted to 450,000.… After many months of research and inquiries among our people, who were pouring from thousands of prisons and concentration camps spread out all over Russia, we were able to put the number at 1,500,000 to 1,600,000 people.” Behind those shocking figures were the horror stories of Soviet confinement—only 170 survivors of 20,000 at one slave mine, 3,000 to a man dying at another. Tens of thousands of Poles, civilians including women and thousands of orphans as well as soldiers, trekked hundreds of miles to Anders’s camps along the Volga River. Several hundred started out from a camp above the Arctic Circle, and the only one who did not die on the 3,000-mile journey did expire the day after he arrived. But, ominously, of the 17,000 Polish officers known to have fallen into Soviet hands, only 2,000, including just two of 14 generals, turned up. With Sikorski, Anders met Stalin on December 3, 1941, to press him on their whereabouts. “They must have escaped,” answered Stalin. “Where could they have escaped to?” asked Anders. “Well, to Manchuria,” was Stalin’s feeble response. In fact, over 4,000 had been massacred by the Russians and were at that moment buried in the Katyn Forest near Smolensk, awaiting discovery by the Germans in 1943. These would be the only ones ever accounted for. The Soviets reneged on their promises and delivered only half the food and medicine that Anders requested. Through the autumn and winter of 1941, the Poles lived in nothing more than canvas tents while dysentery, malaria, typhus, and hepatitis spread. In the spring, the Soviets began demanding that Anders start sending troops west to the front. Knowing that in their still-weakened state such an order would lead to useless slaughter, Anders instead secured permission in April 1942 to ship 74,000 troops by rail 1,200 miles south to Tashkent, Uzbekistan. Some 41,000 civilians followed. In August 1942, Anders moved his people further on their exodus, to Krasnovodsk, Turkmenia. From there, he shipped them across the Caspian Sea to the port of Bandar Pahlavi, Iran. The civilians were sent east to camps outside Tehran while Anders and his troops continued west first to Iraq, then Palestine. There he began building his troops with other Poles already fighting in the Middle East in what was to become the 125,000-man Polish II Corps. Historian John Keegan called this storied unit “one of the great fighting formations of the war,” and its future would include international renown for assaults against Monte Cassino in May 1944. The Poles fought their way in a veritable shooting gallery of foxholes, pillboxes, bunkers, mines, wire, and devastating interlocking fields of fire defended by ferocious German paratroopers. “I noticed that the Germans very wisely stayed under cover at all times, whereas our men would suddenly stand up to hurl defiance at the enemy. They paid dearly for these and similar acts of bravado,” a Polish officer said. During the first attack, the Poles took Hill 593, then defended it through four counterattacks until only one officer and eight men were left. They fought their way to the top of Phantom Ridge but could not reach the end of the heights. One Polish soldier described the relentless German shelling: “The explosions sounded like an enormous giant clearing his throat.” Polish phone lines were cut and most of the radio operators killed, making it almost impossible to relay commands and direct counterbattery fire. “It soon became clear that it was easier to capture some objectives than to hold them,” Anders concluded. He broke off the first attack. Leese found Anders in his trailer uncharacteristically disheveled and distraught. “What do we do now?” he asked Leese. “Stay where you are, but hang on to what you have. Don’t lose that whatever happens,” responded Leese. “But we must attack again,” said Anders. The Poles did attack again just two days later, with Anders telling his troops: “May your hearts be those of lions.” Cooks, drivers, and staff personnel were thrown in to fill the depleted ranks. The Poles took and this time held Hill 593 and Phantom Ridge. The next morning, the Poles cautiously inched up to the monastery to find it had been abandoned. At 10:20 am, May 18, 1944, the Polish flag flew atop Monte Cassino. The Poles were emaciated, lice-ridden, and diseased but still proud, as Anders found at his first review. Anders described the battlefield: “Corpses of Polish and German soldiers, sometimes entangled in a deadly embrace, lay everywhere, and the air was full of the stench of rotting bodies.… Crater after crater pitted the sides of the hills, and scattered over them were fragments of uniforms and tin helmets, Tommy guns, Spandaus, Schmeissers and hand grenades. 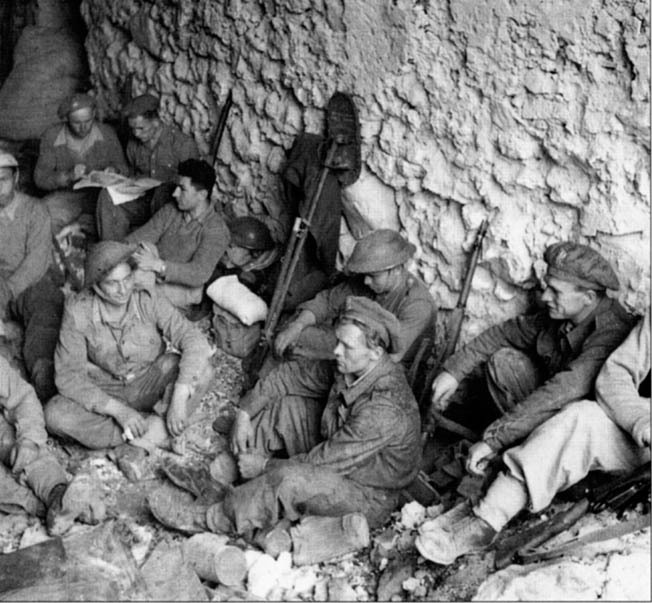 Of the monastery itself there remained only an enormous heap of ruin and rubble, with here and there some broken columns.… Priceless works of art, sculpture, pictures, and books lay in the dust and broken plaster.” The capture of Monte Cassino cost the Poles 860 killed and 3,000 wounded. 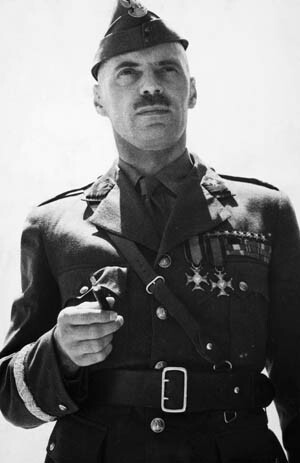 Monte Cassino earned Anders and the Poles international acclaim. He was awarded the Legion of Merit, the highest American decoration available to a foreigner, in a ceremony, appropriately enough, below Mussolini’s balcony in Rome. Chief of the British Imperial General Staff, Viscount Alanbrooke, said, “The series of offensives carried out from Cassino onwards would hardly have been possible” without the Poles. The Yalta Conference, which took place between Allied leaders as the defeat of Nazi Germany approached, was the near breaking point for Anders. Poland was to be left a satellite of the Soviet Union. Thirty of Anders’s men committed suicide, and he requested that his corps be withdrawn from the fighting. The Poles ended the war by capturing Bologna, with Anders receiving the division flag of the German paratroopers who had fought them at Monte Cassino. It would be the last moment of triumph in Anders’s life. He became commander in chief of all Polish forces in the West; then, working out of a small London office, he ran the organization to resettle ex-Polish servicemen abroad. Stripped of his citizenship by the Polish Communists, the very mention of his name outlawed in Poland, Anders to his dying day, in 1970, never forgave Britain and the United States for what he considered the betrayal of his country. Tags British Eighth Army, Joseph Stalin, Jozef Pilsudski, Katyn Forest Massacre, luftwaffe, NKVD, Polish II Corps, Red Army, Soviet Union, Winston Churchill, Wladyslaw Anders, World War 1, WWI, Yalta Conference.